From McCormick's Grill Mates line comes Grill Mates Hamburger Seasoning. 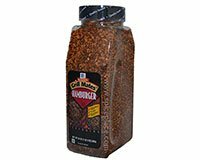 Grill Mates Hamburger Seasoning is a special blend of herbs and spices that mix with ground beef to make great tasting hamburgers. With Grill Mates Hamburger Seasoning, all you need to do is mix the spices with some ketchup and combine with lean ground beef. You'll end up with great tasting burgers whether barbecued, broiled or pan fried. Grill Mates Hamburger Seasoning is the easy way to delicious meals. Ingredients: Salt, Spices, Onion, Red Bell Peppers, Sugar, Garlic, Grill Flavor (From Partially Hydrogenated Soybean and Cottonseed Oil), Natural Flavor and Sulfiting Agents. Lean Ground Beef 1 lb. 6 lbs. Hamburger Seasoning 1 tbsp. 6 tbsp. Sauce 1 tsp. 6 tsp. Mix ground beef, ketchup, Grill Mates Hamburger Seasoning, and Worchestershire sauce in a bowl. Grill patties over medium heat 4-6 minutes per side or until burgers reach an internal temperature of 160°f. Top each burger with a slice of cheese about 1 minute before cooking is done. Toast rolls on grill for about 30 seconds. Serve burgers with bacon slices on the toasted rolls and garnish with pickles, ketchup, and mustard. McCormick® and Grill Mates® are registered trademarks of McCormick and Company, Hunt Valley, MD 21031.